As we all know, celebrities love to be flash and show off their money. Cars are just one way that they can do just this and many have spent millions on some extremely unique cars. 9. The American rapper Rick Ross forked out $430,000 on his Maybach 57. The car accelerates from 0-62mph in 4.9 seconds and reaches a top speed of 190mph. He even named his “Maybach Music Group” after the car and mentions the car in several of his raps! 8. Car enthusiast Jay Leno, an American Comedian, producer, actor and writer, comes in at number 8 with his Mercedes SLR McLaren which cost him $500,000. This car reaches speeds of 208mph and goes from 0-60mph in 3.7 seconds, while Leno’s home boasts a 17,000 square foot garage with 169 of the most extraordinary and extravagant cars inside. Leno also writes regular columns in the Popular Mechanics magazine showing off his car collection and giving automotive advice. 7. Nicholas Cage, American actor and producer, owns a red Ferrari Enzo costing $670,000. The car reaches speeds of 218mph and goes from 0-62 mph in 2.5 seconds. Nicholas Cage got into some financial difficulties recently due to failing to pay his taxes and bad investments so this car may have been an added factor to his money problems! 6. American comedian, writer, actor and producer Jerry Seinfeld comes in at number 6 with his Porsche 959 costing $700,000. Jerry owns forty-six Porches and is thought to own the first and last air-cooled Porsche 911’s. This Porsche is one of only 337 built and is rumoured to be the centrepiece of his collection. The car reaches 195mph and goes from 0-60mph in just 4 seconds. 5. American entrepreneur Kanye West owns a matte black Lamborghini Aventador costing $750,000, however with a net worth of $120million this car wouldn’t even make a dent in Kanye’s wallet! 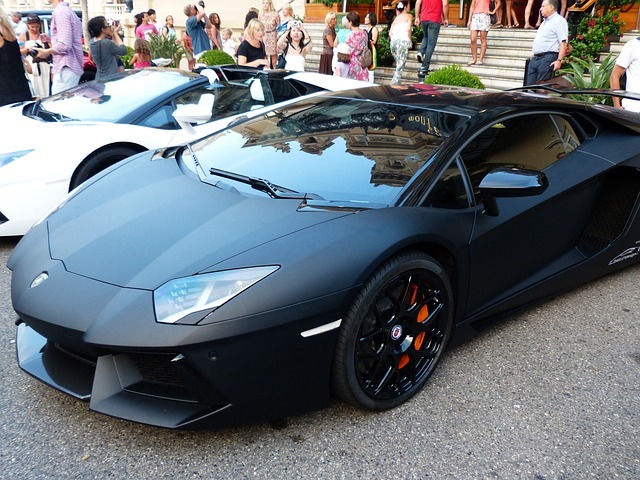 The Lamborghini reaches 217mph and goes from 0-60 mph in 2.8 seconds. This car was famously crashed by Kanye’s service driver when he hit Kim Kardashian’s electric gates! 4. Simon Cowell, English reality TV celebrity, music and TV producer and talent scout, owned a $1.7 million Bugatti Veyron in black. The car was bought in 2010 by Cowell just because a friend told him to, which might be why he only drove it twice in the four years he owned it! The car’s top speed is 254mph and goes from 0-60 mph in 2.5 seconds. Simon Cowell has now sold the car for $1.3million with only 1,300 miles on the clock. His Bugatti Veyron was also the first ever certified used-Veyron sold! 3. At number 3 is rapper and CEO of Cash Money Records Birdman, whose red Bugatti Veyron is worth $2,000,000. The car reaches a top speed of 254mph and goes from 0-60mph in 2.5 seconds. This car was not only used by Birdman to drive Nicki Minaj to a club but was also given to Justin Bieber as a gift! 2. There is not a clear winner for the most expensive celebrity car as they are both the same price. One of the most expensive celebrity cars is Flo Rida’s ‘golden’ Bugatti Veyron which comes in at a whopping $2.7million! As with the other Bugattis, the car reaches 254mph and goes from 0-60 in 2.5 seconds. The rapper bought the car in white then wrapped it in a chrome colour before changing it to a shiny gold. 1. Also at number one is Lil Wayne’s Bugatti Veyron. This car also cost Lil Wayne $2.7 million however Lil Wayne was the first rapper to own a Bugatti and loved it so much that he named a song after it!